Born at Buckfastleigh in Devon in 1839, Edward married Matilda Lynn (1841-1919) at Fitzroy in Melbourne on 28 March 1865 (the couple are pictured below later in their lives). 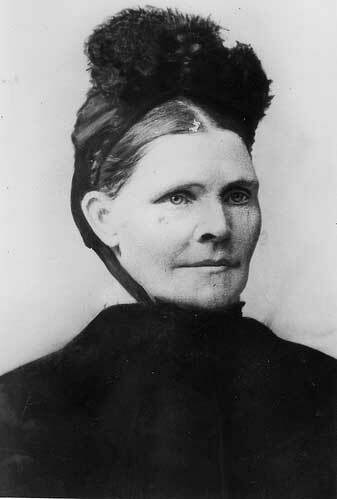 Matilda was born in County Antrim in Ireland in 1841, the daughter of Henry Quin Lynn and Jane Brown. The Victorian Assisted and Unassisted Passenger Lists, 1839-1923 show that, when she was 18 years-old, Matilda sailed from Plymouth in England to Port Philip on the ATALANTA, arriving at Melbourne on 30 May 1860. The ship's entry showed she had been contracted to work as a general servant for a Mr Sharp of 21 Fleet St in Collingwood from 4 January 1860. Her period of employment was three months for which she was to be paid £25. A Roman Catholic by birth, she could then read but not write. After their marriage the couple lived first at Donald where Edward worked as a stockman and then for much of the remainder of their lives in the Thalia-Wycheproof area. 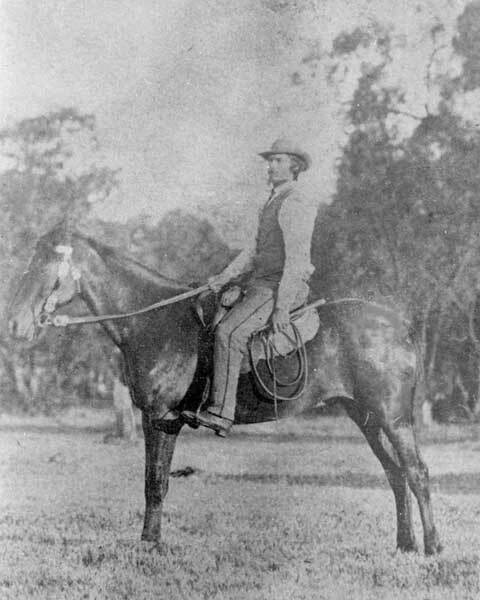 Edward was an expert horseman who was considered at one time to be the champion rough rider of Victoria. Robert White tells us that according his uncles, a framed version of the photograph of Edward pictured on the left could be seen at the residence of his daughter Catherine Whelan nee Shepherd. It was hung between the portraits of the old couple shown below. An extract from the Wycheproof Ensign dated 23 March 1906 (and published in the local Times Ensign 104 years later) noted that Edward 'first became acquainted with Mt. Wycheproof when engaged on stations around West Charlton and Wycheproof. He was employed by Messes Clarke and Atkinson as a stockman when 2,000 cattle were kept on the Wycheproof station and needed some attention in the wide stretches of country available to them. At that time Mt Wycheproof was remarkable for the kangaroos which sheltered amidst the rocks. Mr Shepherd recalled riding around the base of the mount looking for cattle.' The extract added that Edward also 'managed Thalia Station for eight years and only selected when the whole of the country was being taken up'. The 1903 electoral roll for the Wimmera Division showed Edward and Matilda, both farmers, living at Wycheproof along with two of their children, Phoebe Emily and Thomas Chaffe Shepherd. According to the newspaper extract cited above in around 1905 Edward was forced by ill health to sell his farm and seek to 'settle in a more northerly locality'. As a consequence, the extract continued, 'the district loses one who has been identified with its history for the past 53 years and who has earned the title of the town's "oldest inhabitant"'. It seems that Edward and Matilda decided not to move 'to a more northerly locality' but to buy a place in Wycheproof where they were registered as living at the time of the 1909 and 1914 electoral rolls. The Wycheproof district lost another of its old identities on Monday when Mrs Matilda Shepherd, wife of Mr Edward Shepherd, passed peacefully away in her sleep. Deceased was 80 years of age, and has been ailing for the past four months. She was of a retiring but pleasant nature and had all her faculties almost to the last. The cause of death was senile decay. 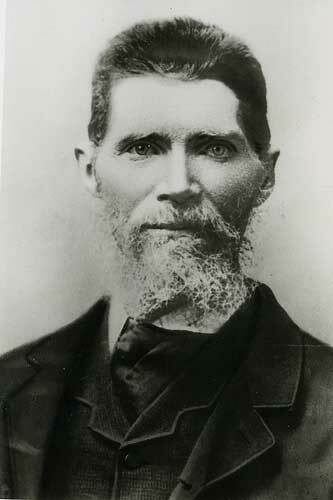 Deceased was born in the County of Anthrem [sic], Ireland and came to Australia in 1861. Four years later she was married, and after living near Donald for a few years made her home at Thalia, and resided in this district during the past 47 years. During that time the family made a wide circle of friends who have expressed regret at the demise of their old and respected friend. In addition to her husband, two daughters (Mrs M. Ryan of Thalia and Mrs J. Whelan of Wycheproof) and four sons (Edward of Lalbert; Tom at Wycheproof; Robert of Bendigo; and John of Condobolin) are left to mourn their loss. Deceased also leaves 45 grand children and five great grand children. The body was followed to the Wycheproof Cemetery on Wednesday afternoon by many friends and sympathisers. Rev Father O'Connor conducted the burial service. Mr Edward Shepherd, whose wife died last week, only survived her for a week, as he passed away on Monday evening last week at Wycheproof. He was about 83 years of age, and was born in Devonshire, England. He came to the colony in 1853 as a lad, and went to Rich Avon Station. At one time he was considered to be the champion rough rider of Victoria. He commenced farming at Thalia in 1884 and was a resident of the district for 47 years. During that time he made many friends who heard of his death with regret. Two daughters (Mrs M. Ryan and Mrs J. Whelan) and four sons (Edward, Thomas, Robert and John) are left to mourn their loss, also two brothers (Robert and William) of St Arnaud, Deep sympathy is felt for the members of their double bereavement. Provided by Robert White, these photos are of Edward Shepherd (1839-1919) and his wife Matilda Lynn (1841-1919). Edward and Matilda Shepherd had seven children: Jane Elizabeth Ryan (1866-1926), Edward Shepherd (1867-1946), Thomas Chaff Shepherd (1869-1945), Robert James Shepherd (1871-1934), John Finlay William Shepherd (1875-1938) and Matilda Catherine Whelan (1877-1943). Click here to read of their lives, families and descendants. As noted in Matilda's obituary, cited above, at the time of their parents' deaths in 1919 their seven children had together provided their beloved parents with 45 grandchildren and five great grandchildren. Our most recent, and still to be completed, review of the family shows that, one hundred years later, the known number of Edward and Matilda's descendants stands at 50 grandchildren and at least 148 great grandchildren, 176 great great grandchildren and 100 great great great grandchildren.